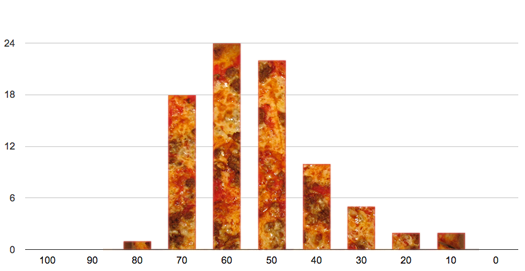 A distribution of the pizza scores from 2009, 2010, and 2011 (so far). Now that we have about 2.5 tournaments-worth of scores on the 100-point scale from the Tournament of Pizza, we thought it'd be interesting (well, probably more fun than interesting) to crunch the numbers on those scores. Results from the semi-finals of TOP2011 next week. The 2011 Tournament of Pizza is sponsored by Sunmark Federal Credit Union, which is collecting donations for the Regional Food Bank of Northeastern New York to help Irene recovery efforts. This is awesome! It really puts the scope of how wide the discussion of pizza on AOA has been over the past few years into perspective. Man, numbers can be misleading. I thought this post was fantastic until I saw Lou Bea's so far down on the list! I went back and read up on last year's TOP to see what happened and saw that it was more a matter of preference on that garlic crust. I haven't been to the Delaware shop, but I live near their old uptown location. When I first moved here from the Midwest, Lou Bea's was the first NY style pizza I ever tried and I thought it was one of the best things I'd ever eaten! I was so sad when they closed the uptown location, I really miss their pies. The pizza joint that took over the location, Bellow Pranzo, is terrible. Valerae, thankfully it's okay to disagree with the judges. This whole exercise gives so much great exposure to places I've never heard of - I am definitely going to be visiting a number of these establishments. @derryX: My first thought after pulling together all the scores: yow, that is a lot of pizza. @Valerae: I too had been a fan of Lou-Bea's. And that 2010 score was somewhat the result of taste preference, but I do remember the garlic on that pizza's crust being burned and bitter. It was a tough break. You're right -- the judges do take this very seriously. And I think the opportunity to taste two pizzas side-by-side does help a person put a pizza's quality in perspective. But in the end these scores are a compilation of four people's opinions -- there's going to be disagreement. And if people see (or taste) things differently, we're always happy to hear it. "This whole exercise gives so much great exposure to places I've never heard of - I am definitely going to be visiting a number of these establishments." That's great! I've been thinking that we should draw on the experience of the TOP to create a pizza tour.